About 10 years ago I helped to develop a product that converted videotapes to DVDs. It was called the HP DVD Movie Writer. It was sold for several years under the HP model numbers dc3000, dc4000, and dc5000. Those products are obsolete now, and the software drivers and application software haven’t been updated to work on the more modern operating systems like Windows 7 and 8. I still maintain the FAQ webpage for it and so I periodically get questions about what to use these days to convert analog video tapes to digital formats when customers find their Movie Writers are no longer supported. I’ll attempt to answer that question in this article. The HP DVD Movie Writer was introduced at a time when few computers had a DVD writer included, so it made sense to bundle a DVD writer with a video capture device along with the necessary software and offer it as a solution. Converting videos from tape to DVD can be very laborious, and most people are primarily interested in preserving the video in a format that is likely to outlast video tape and be playable on devices that people are still using years from now. The VCR player has been relegated to the closet in many homes years ago and videotapes are gradually degrading, so it’s important to get them copied to a digital format if you want to preserve these videos for your children and grandchildren. You may also want to convert them so that you can upload them to a video sharing service like YouTube. Most video capture products available today come with software that will help you edit the videos, and that can be fun and produce amazing results, but it requires some effort and a bit of learning to edit a video. The way most home videos are shot make them hard to watch because they have no story line along with little or no narration and so they tend to sit on a shelf forever after being watched once or twice. After watching a few home videos, it really gives one an appreciation for all that goes into making up a video that is entertaining to watch. But it’s still nice to know your old videos are still there ‘just in case’ one day you get ambitious and want to create a nice video for your family to have and share with their children. As time goes by, it will get harder to find a player you can connect up to a TV to play them. Capturing analog video tapes to digital files is essential if you ever want to watch the videos again at some point in the future. Now that many computers include DVD writers, when people ask me what I recommend for converting video, I generally tell them to use a USB video capture device from a reputable company. Very inexpensive video capture devices are available now, some for less than $10 from no-name Chinese companies that you can buy on Amazon.com or Ebay. I’d stay away from them as they usually come with very poor documentation, no support, and minimal software included. I’d stick with a device from a well-known company that has been in the business for a while like Diamond Multimedia. The Diamond VC500 is one of their more popular products that has been around for a while and in general gets good reviews. The box contains the capture device, a setup guide, an install CD and a video cable. The VC500 costs around $35 and has software included with it that lets you capture and edit the video as well as produce the DVD. Capturing simply converts the video on your analog tapes into digital files, known as MPEG files, which typically end with the extension MPG. For preservation purposes, this is the most important step, that is, getting the videos into a digital format. Editing involves cutting up the mpg files and add things like title blocks, transitions between segments, dubbing in music or narration, and in general, making your videos more watchable. It’s what we take for granted when we watch a commercially produced video. A well-edited video is a joy to watch. DVD authoring is what allows you to set up a navigation menu and chapters so that when you put the DVD in the player, you can more easily select which part of it you want to watch. You don’t have to split up the video on the DVD in chapters, of course, it just makes it more convenient to watch, especially if you have multiple events stored on the same DVD or if you want to be able to watch it in segments. 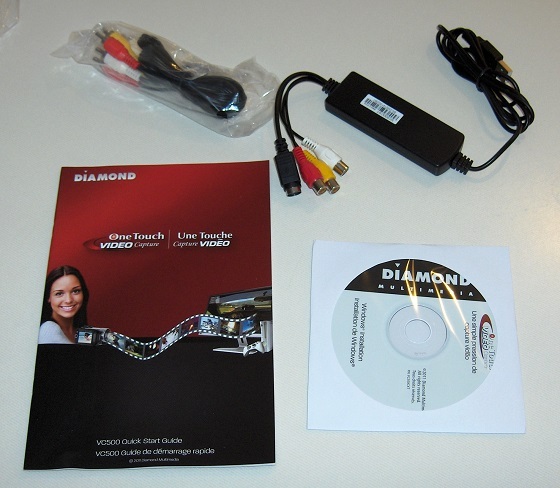 The software included with the Diamond VC500 is compatible with all modern version of Windows from XP to Windows 8. One of the programs the VC500 includes is Showbiz from Arcsoft, and that’s the same software HP shipped with the HP DVD Movie Writer. I found it easy to learn and use and it can do everything you will need from capturing and editing the video to authoring the DVD. Showbiz has been around for a long time and has all the features you’d need if you want to edit the video as well. The install CD has an easy-to-use menu to help install the software on your computer. The items included with the VC500 include the software installation CD, the video capture device which attaches to a USB port, an AV cable that connects to your VCR or analog video source, and a Quick Start Guide. When you insert the installation CD into your computer, you will be prompted to install up to 3 programs. I first installed the driver, then the software called EZ-Grabber, and then Showbiz. There was also a program called Dyyno Broadcaster that was installed, but I don’t think that I will use it. It appears to be an on-line video sharing site like YouTube, but with a program to make it easier to share your videos with others on the Dyyno website. You need to set up a login on that site if you want to use it. In reality, I believe you could get by with just installing the driver and Showbiz, since Showbiz has the ability to capture video like EZ-Grabber as well as editing and DVD authoring. But EZ-Grabber may be easier to use if all you want to do is get the files in digital format for playback on a computer. 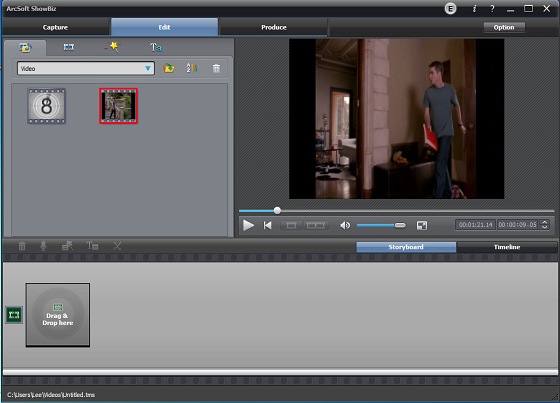 Arcsoft’s Showbiz 3 is an easy-to-use video capture-edit-DVD authoring package. If you have a lot of videos, make sure to have plenty of hard drive space available since capturing video consumes about 3 to 4 GB per hour of video. You can capture in lower resolution to save space, of course, but for the best quality capture, I’d recommend MPEG2 720×480 quality since that is the native format of DVDs. There’s not much point in trying to capture analog sources at HD quality since they are not high resolution sources and so it won’t help make the image look any better. And I wouldn’t worry so much about editing the videos or making DVDs right away, just get them all captured to MPG files, rename them to something that will let you know what’s in the file possibly with the year they were shot such as “1992-hawaii-vacation.mpg” and that will help you to organize them into easy-to-find files for when you do want to create your DVD masterpieces. And I’d recommend you keep the original mpg files even after you’ve made DVDs, since that way you can always cut and splice segments of video together to create new DVDs should the need arise. When you burn a DVD, make sure to use the write-once media, not the re-writable media, even though re-writable media sounds like it’s more flexible. The name for write-once media is DVD+R or DVD-R. Rewritable media is called DVD+RW or DVD-RW and it’s really better for storing computer data like a backup that you may need to overwrite in the future than it is for making playable DVDs. The rewritable DVDs are not as compatible with DVD players as are the write-once DVDs because their reflectivity is lower. Also, make sure to get a known brand of media like Verbatim, Maxell, or Sony because name brand media is supported by most DVD writers. Store and no-name media brands of media may be cheaper but do not always record or play back reliably. Great article, doing my research before I buy to be sure this device will do all I want it to do. Everything I have read so far has not specifically addressed one major issue to me, that is, after I create the DVD will it be playable on my home DVD player to view on my TV or will it only play on a computer? My player (Samsung) uses terms like “DVD-VIDEO” and “FINALIZED”. Your article mentions “AUTHORING”. Is this all the same? Thanks for your help. Hi Bob, Yes, the idea behind ‘authoring’ is to record the data in a way that it can be read by DVD players and watched on a TV. It requires a special arrangement of the files on the DVD, which will be in two folders, one called VIDEO_TS and another called AUDIO_TS. Usually only the VIDEO_TS has files in it but some players require both folders at the top level. You can’t simply copy a mpg file to a DVD disk and have it play on a DVD player. That is what is meant by ‘authoring’ or ‘producing’ a DVD. Showbiz now uses the term ‘produce’ for that function but back in 2003 we used the term ‘author’. You can add titles, menus, background, etc. at the authoring stage or simply have it make a DVD with just the video on it. I bought a DC-4000 when I worked for HP 10 years ago and never got around to using it. Finally got it out of the box last weekend and wasted a couple of hours trying to get it work on Win7. Read your article and installed to the old XP laptop and it works just fine. Thanks so much for sharing your expertise and advice.